Hi, William. Thanks for your comment. I think the central face is a kind of variation of “tiki”, which usually represents Polynesian semi-gods in form of animals. The patterns around the closed eyes might be nostrils of tiki. Nostril means foreseeability, smelling crisis before seeing it. Closed eyes are often used with nostril symbols. The three bandings below the face are shark teeth, fish scales and spear heads. The big patterns on left, right and top might be nostrils two. However, I can’t assure the accuracy of the words above, because I’m still a newbie studying it. I’m also not sure about the meaning of the round pattern on top left and small pattern below tiki eyes. can i ask what does the patterns in this tattoo mean? I really would like to find out the meanings before i tatto it! I’ve checked your photo and I have to say I only know a few basic symbols like Marquesan crosses and turtle shells. There are quite a lot of symbols that I don’t know in this design. Since Polynesian tattoo meanings and designs can vary from artist to artist, this tattoo’s meanings largely depends on the mind of the author. I guess this design was done by a very skillful Polynesian tattoo artist who is an expert in Polynesian symbols and designs. Good news is, since this is a design from Storm 3d Tattoo Designs, you can send emails to Mark Storm, who designed all the designs of Storm 3d, to get detailed explanations about this tattoo. His email is info@storm3d.com. What sort of ink/technique its used to get the tattoo looking so black? or the pictures shown the tattoos straight after they were done?? It’s complex. I think it depends on ink quality, depth, skill of the artist, and photography techniques. Well, maybe this can be explained by comparison with religion. Different religions originate from different places, or countries. But all religions have loyal believers in the whole world. They can live anywhere in this world. 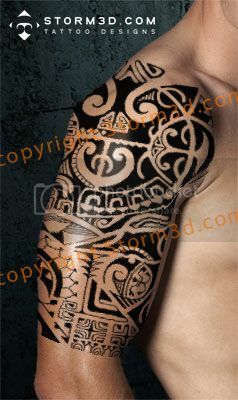 I don’t think Polynesian people would mind someone getting tattoos based on their culture. If I am Polynesian, I would be happy to see so. And there are many skilled tattoo master living in Polynesian triangle and as far as I know that they’re very happy to tattoo nearly any people living in this planet. It’s just my opinion. The choice is yours. but I don’t now maybe it have some special meaning. Can you help me and write that exactly this tattoo means. This page contains a few ones. Which one? I want a polynesian tattoo that means faith, family, strength, and adversity… What are those symbols? These meanings can be represented by different combinations of basic symbols. Different artists have different minds to represent them. Hi, was wondering if you send me a picture or photo of the Polynesian tattoo design for meaning Father, Mother, Daughter, Daughter, Daughter, Son, Sun God, God and Jesus. This is what I’m hoping to have done on my pec, back of shoulder and upper arm sleeve. Many thanks in advance. You’d better find an artist to design a unique Polynesian tattoo with these meanings just for you. Every Polynesian tattoo should be unique for just one person because everybody has different life experience. Do you have a polynesian tattoo in chest that mean a “new beginning” thanks…..
Hi guys, i’we been watching your’s work for a wile and i really have to say ” u know the knowledge ” . Now I have a question, if u can please answer me in short period, i want to tattoo a actor Dwayne Johnson, the part i’m really interesting is that on his chest. Now i’m not to lazy, i did search on google but not never can’t find real meaning of it.. Please answer me meaning of that. I only know some basic symbols. The meaning of a tattoo design mainly depends on the artist and the story of people. If someone can send me it, i’d really appreciate it.